As far as George Bernard Shaw was concerned, the most important things in life were words. Despite a keen amateur interest in photography, which revealed a skill for visual communication, the great passion of his life was language and the things he could do with it. As a journalist he used words to distill facts, as a playwright and novelist he used them to entertain and inform, and as a politician he used them to influence. During his long life, which began in Dublin, Ireland in 1856 and ended in Hertfordshire, England in 1950, Shaw wrote more than 250,000 letters to acquaintances near and far, crafted 63 plays and five novels, and produced a vast collection of essays and articles passionately arguing his Socialist views. Shaw possessed strong opinions from a young age, initially focusing his youthful attention on the education system in Ireland, which he reviled. 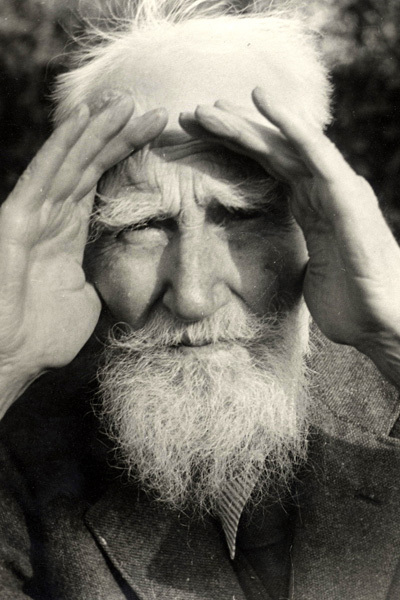 Born to a successful grain merchant (George) and a housewife turned singer (Bessie), Bernard Shaw - as he preferred to be known - grew up with two older sisters. He frequently changed schools, moving between various colleges around Dublin, and his experiences in these institutions contributed to his lifelong loathing for formal education. The fragmentation of his childhood was amplified when Shaw was 15: his mother left her alcoholic husband to follow her singing teacher to London. His sisters moved with their mother, but Shaw stayed on in Dublin, living with his father for several years as he completed his schooling and then took on an office job that he loathed. After several years of bureaucratic drudgery, he too moved to London where he lived with (and relied financially upon) his sisters, his mother and her lover George Vandeleur Lee. Once living in London, Shaw pursued a creative life as best he could on his meagre allowance, spending much of his time in museums and libraries reading voraciously and eventually writing. He produced several novels that failed to gain traction with publishers, and he scraped by for almost a decade on small writing jobs until he finally secured a role first as a theatre critic and later (and more successfully) as a music critic. Finally he had a career as a writer and was able to support himself financially, which gave him greater freedom to pursue his interests, chiefly politics. From a young age, Shaw showed a particular interest in Socialism and committed himself to the Fabian Society, an organisation devoted to advancing the principles of democratic socialism through gradual, reformist (rather than revolutionary) means. It was here that he made strong friendships with fellow Socialists, including Sidney and Beatrice Webb, with whom he co-founded the London School of Economics (LSE) in 1895. The Fabian Society is also where Shaw was introduced to his future wife, the forward-thinking heiress Charlotte Payne-Townshend, a fellow native of Ireland. After being introduced by Fabian friends, the pair developed a largely intellectual closeness that developed into a stronger bond when Shaw developed a life threatening infection that Payne-Townshend nursed him through. They married in 1898 (when they were both 41 years old), and Shaw pursued a career in politics, being elected as a councillor representing the area of St Pancras on the London County Council. Living between a house in London and a house (known as Shaw's Corner) in the village of Ayot St Lawrence in Hertfordshire, the Shaws never produced any children (or consummated their marriage) but rather focused their energies on travel, advocacy and the arts. Shaw engaged in extensive international travel, encouraged by his wife, and the Shaws each donated large amounts of money to a range of causes. Charlotte, who had originally invested in the LSE, supported causes including the launching of the feminist magazine The New Freewoman, while her husband sent small sums of money to various causes throughout his life. Shaw, who strayed beyond his marriage and pursued several relationships - and many more flirtations - often with married women, was generous towards the objects of his affections. Throughout his marriage, Shaw turned to playwriting, using his famously sharp wit as a way to express some of his strongest socialist views and, after a few shaky attempts, he began to find success as a dramatist, with Mrs. Warren's Profession being well received once the issue of censorship was overcome, and Pygmalion premiering in 1912 to the strongest commercial response. Shaw extended his fame and influence at the onset of the First World War, which he publicly and controversially denounced. Despite selling thousands of pamphlets and attracting a large amount of interest for his anti-war message, Shaw was ultimately largely unpopular for his views, which were considered to be unpatriotic. Yet swimming against the tide was something that never bothered Shaw and throughout his life he supported a diverse range of causes varying from vegetarianism to eugenics, atheism to Stalinism. Even after the death of his wife in 1943, Shaw continued to write and offer his opinion on a range of topics, only stopping in 1950 when he died at the age of 94 from injuries sustained after falling from a ladder while pruning a tree in the garden at Shaw's Corner. Opinionated to the end, Shaw was pointed in how he willed away his fortune, gifting large amounts to various public galleries and museums. The largest amount went towards the development of the Shavian alphabet - a phonetic alphabet that Shaw hoped would one day replace the Roman alphabet - but this project was ultimately a failure. Shaw is remembered with regular revivals of his plays, the formation of numerous Shavian societies, the Shaw library at the LSE and an annual Shaw festival in Ontario, Canada.